It's my dream to become an entrepreneur. Even before I set foot in Dubai, I was already doing some sort of small business in the online industry. After all, I've experienced being a sampaguita street vendor in the province. I tried several business ideas with different people but failed. Maybe the focus was wrong. Maybe we were looking more on the self-centered gains and only on the money. I took short courses about business but done nothing really afterwards. I told myself, whatever business I'd do - whether a restaurant, a laundry shop, an events company or a service-oriented business, I should have these 3 principles on my checklist. I heard the message by heart. Realizing I may have worldly ambitions, I asked God to reset my plans and all things in my head that may not be aligned to his purpose. Every single day I prayed that he fill me up with thoughts on what he wants me to do according to his will. Truly indeed, "The Lord foils the plans of the nations; he thwarts the purposes of the peoples. But the plans of the Lord stand firm forever, the purposes of his heart through all generations." For more than 6 months, I have no plans, I emptied my mind and submitted everything to him. It was 2:30 in the morning, 1st of March 2017, when I received God's answer. I woke up and was lead to reading a featured story on my 2017 planner. It was about an entrepreneur in the Philippines who put up stores to sell t-shirts and other merchandises with printed words from the bible. For years, I've been persistent on my prayer for God to use me in any way he wants me to bring him honor and glory. 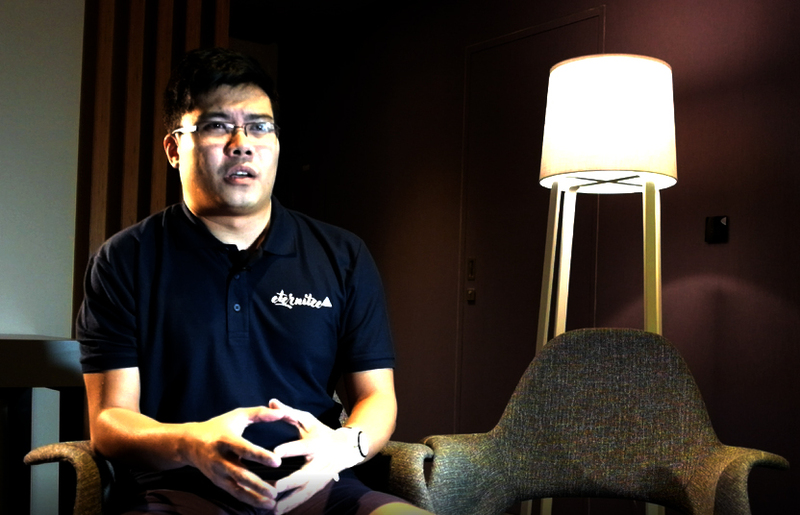 When I read about the entrepreneur's story, I realized God brought me to where I am right now - the kind of work I do, the things I'm passionate about, the technology, the influence, the place I am right now. The revelation allows me to figure out how I can be used by God. I understood how I can live a more purposeful life. Right at that moment, before 3am, I was able to conceptualize a similar business with a little twist. I thought of bringing God's words of comfort, love, hope, mercy and his promises closer to the people. I can use my skills in design to create t-shirts that will not only express one's faith, but will also bring inspiration and encouragement more importantly. I can use my currently developing journey with God to share with others what I learn. Right at that moment, I visualized that it would be more of an advocacy than business. The priority is to make God's goodness and kindness known to many. The business aspect comes secondary. Right at that moment, I was defining quick strategies. Right at that moment, I was scribbling SWOT analysis. I was able to identify key strengths and opportunities. I was able to list down my weaknesses and the threats. Right at that moment, I was sketching t-shirt designs. Right at that moment, I was researching intently how similar businesses operate. Right at that moment, I was drafting a business plan. Right at that moment, the energy was at the highest. Ideas are overflowing. Right at that moment, I was listening to God talking to me - that it's all his plans to put me in the internet industry, to grow a passion in design, to somehow have an influence online, and to give me a place in the community. Sort of. I was asking for a business idea, and God gave me a "spiritual" thing to do. Will it work? 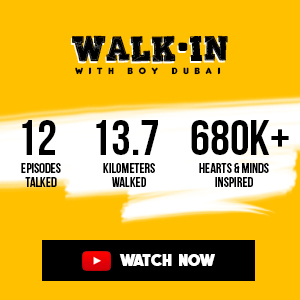 There's not too many Christians in Dubai; and we are in an Islamic nation. I had this question because I was also thinking about the sustainability of the idea. In one way or another, this has to have a market. It has to be marketable. I have to be a good steward of what God has given me. "There are 2.3 billion Christians in the world... bigger than America and China combined." And what was I thinking to do again? An online store! That means the reach won't be limited to the country I'm currently living in. So that was a loud affirmation. Even if we only look at the 1% of it, we are still talking about 23,000,000. Even the 1% of 1%, we still got 230,000 people - not bad at all! Confirmed and composed, I spent the following days planning, preparing and praying about it. I am not a saint. I'm a sinner. I've done silly things and I was stupid. I'm broke and I live in a dysfunctional world. I'm not perfect and at times I feel not deserving to be carrying out a solemn mission. But with God's unconditional love and unending grace, he has made me WORTHY to carry on. Philippians 2:13 says, "for it is God who works in you to will and to act in order to fulfill his good purpose." 2 Corinthians 5:17, "Therefore, if anyone is in Christ, the new creation has come: The old has gone, the new is here!" Wow lang! Ang daming encouragement and affirmations! As a visionary, I was able to foresee what the road ahead could look like. It's busy and it's fun. Running a business while working pose some serious challenges. Time is number one. Customer relations should be good at all times. Doing these without affecting our daytime jobs and our family time is on top of our checklist. As few other roadblocks started to show up, I was reminded to carry on when I read this message from Philippians 1:6, "being confident of this, that he who began a good work in you will carry it on to completion until the day of Christ Jesus." So off we go. I shared the idea with my wife and since then, we've been talking about it day in and day out. One good thing about this kind of business is that priorities are always on check. To this date, time with family is never compromised. Our 5-year old daughter is "involved" in what we do - in fact, we are already seeing signs that she absorbs some good business principles at a very young age. And she understand that we are "spreading God's words though our t-shirt business." Raqz and I have also had deeper conversations since we started. We talked about the need of doing this business with a partner. For some time, we pondered who could we possibly invite. Who would share the same vision and principles with us. Who else could be willing to be used by God? We spent about 4 weeks to find the right name for the business. Wear the Word, Faith & Fab, and Faith Essentials are only few among the hundreds of names we enlisted. After "deliberations" Eternitee emerged as the best choice for reasons we all agreed on. The world knows the most popular bible verse, "For God so loved the world, he gave us his only begotten son." For many, it stops there. Eternitee will be the avenue to remind people of the complete message of the verse, "...that whosoever believes in him will have eternal life." 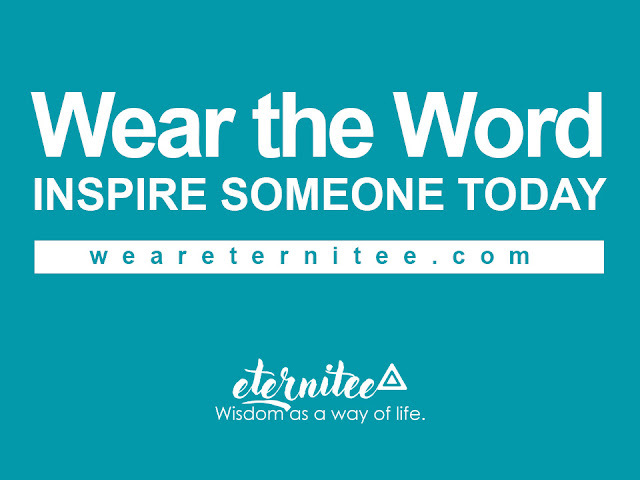 We at Eternitee will just be messengers to remind the world about the premises to receive God's promises. Raqz reminded us that the first thing we need to do is to have the business registered. We cannot proceed doing something for the Lord that is not abiding by the rules. So we registered. It wasn't that quick, because we had to find the most affordable license out there - given that we have a very limited capital. Good thing about doing business with the Lord is you seek his leading all the time. Thankfully he lead us to finding the most suitable e-commerce license for us - and the most affordable one. It's been a month since we launched Eternitee Online Store to the public and it has been good so far. The reception we got from the crowd, from the business and cultural community are so overwhelming. The sincere support we receive from the consulate office and the leaders in the community and the church are very humbling. "Doing business with God" does not entitle us of a smooth sail. As they say, it's tough to live a real Christian life, albeit it's doable. Striving to live a righteous life is an everyday agenda. It's a joy to use our God-given rationale to discern things accordingly. While we are not spared from challenges and struggles, we allow ourselves to be lead by God so we would be equipped with the right principles and right perspective in facing the tough road ahead. At Eternitee, we will continue to witness for the goodness and kindness of the Lord in our own challenge-filled lives. All glory and honor always belong to God.